Select Flooring is the newest wing of The Select Group – valued clients of ours who also comprise Select Roofing, Select Access, and Lightning Protection Ireland. We built and maintain all those other sites. It was therefore only natural they should ask us to do the same for their latest venture. We were happy to get to work for them once again. As this was a new venture for The Select Group, we first performed intensive online market research. We identified relevant keywords and levels of search traffic for each of their services, and drafted a website structure to best suit our findings. Some adjustments took place in consultation with the client, but generally they were happy to leave this element of the project to ourselves, thanks to the fine job we had already done on their other sites. With the plan in place, our senior copywriter got to work. He liaised with company management to not only get details for each service and type of flooring provided, but also to capture the essence of the company’s marketing message. He then crafted text content according to best SEO practice, and delivered it to the client for approval. From there, it was on to the build itself. 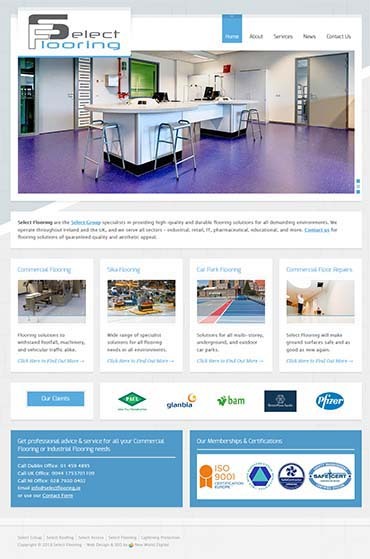 As with other recent projects for The Select Group, the actual website design was relatively straightforward here. That’s because it had been decided in advance that it should match the style and design of the group’s other existing sites. Our designer expertly made the material fit that design, to the client’s 100% satisfaction.